could be misunderstood or misinterpreted. 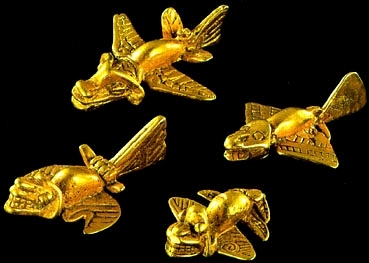 Under the numerous figures, spectacular miniatures of "gold aircraft"
that are termed as "zoomorph", "biomorph" or even as "insects", "birds" and "flying crocodiles". Aeronautical Institute, New York, have confirmed this. 1. The delta geometry of the wings is displayed in a consquent low wing position. All flying creatures are, on the other hand, high wing or shoulder wing. as the respective horizontally aligned elevator contradicts every bird image. transport aircraft as well as with the Space Shuttle. 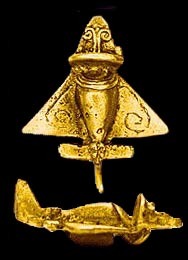 Columbian and Diquis, Costa Rica; about 500 AD.